Arriving late to the glam metal party and lacking the edge or talent to transition towards anything better, L.A. Guns' most commercially successful album has aged quite poorly. Cocked And Loaded is filled with routine, unimaginative hard rock that contributes nothing to metal's evolution. The band is bland, the lyrics banal, the compositions childishly simplistic and the overall sound generic even for the era. With no memorable solos and no distinctive vocals, L.A. 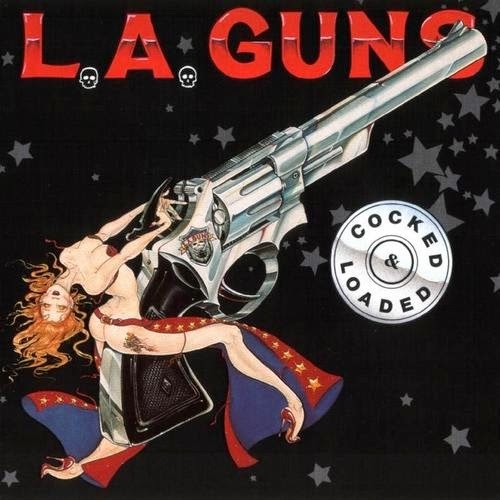 Guns were always the poor cousins of a talentless sub genre that was born brain dead, and Cocked And Loaded now contains nothing except the whiff of sadistic nostalgia for alcohol-drenched second-rate late 1980s Sunset Strip glam. Philip Lewis' vocals are a mix of strained and emotionally fake, while Tracii Guns' guitar work is much more perfunctory than inspired. The drumming of Steve Riley is monotonal in the extreme. The bass is anonymous until it rips off Iron Maiden's Wrathchild on the short instrumental I'm Addicted, ironically the most energetic cut on the album. There must have been a time, when oh-so-ordinary tracks like Slap In The Face, Rip And Tear, Sleazy Come Easy Go and Never Enough sounded exciting to those who completely missed the best of Def Leppard about half a decade earlier, but today these are just the most tolerable of a poor set. Worse are cut and paste selections like Give A Little, 17 Crash and Wheels Of Fire as the back half of the album disintegrates into self-derivative mush. It may pretend to be Cocked And Loaded, but it just fires blanks. Produced by Duane Baron, John Purdell and Tom Werman. Engineered by Duane Baron and John Purdell.